Predictive Diallers and the Philosopher’s Stone. Ask any expert and they will invariably tell you that the third absolute and inevitable certainty after death & taxes is that predictive diallers will generate abandoned calls. Indeed, they will explain that the very nature of the probabilistic algorithms which form the foundation of any predictive dialler is such that it cannot guarantee a free agent to always be available whenever a dialled call is answered, and for this reason calls will sometimes need to be abandoned. As this is unarguably true, it is unsurprising that Noetica’s recent announcement of a new technology claiming to deliver high performance genuine predictive dialling with virtually zero abandoned (dropped) calls has been met with some scepticism. However, in Galileo’s immortal words: “E pur si muove” (And yet, it moves). 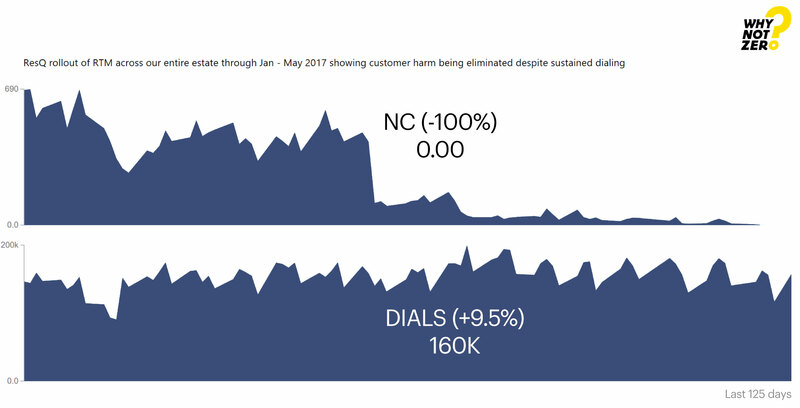 This picture displays on the top chart every abandoned call per day ResQ produced from 1st January 2017 through to 9th May 2017 across every outbound programme. On the bottom chart is displayed every outbound dial attempt made over the same time period. Even though the volume of outbound dialling has actually gone up overall, the number of abandoned calls has steadily reduced to 0 as the full solution has been rolled out programme by programme. This picture displays on the top chart every abandoned call per day ResQ produced from 1st January 2017 through to 9th May 2017 on a single major B2C outbound campaign. On the bottom chart is displayed the average wait time (AWT) on this campaign in the same time period. 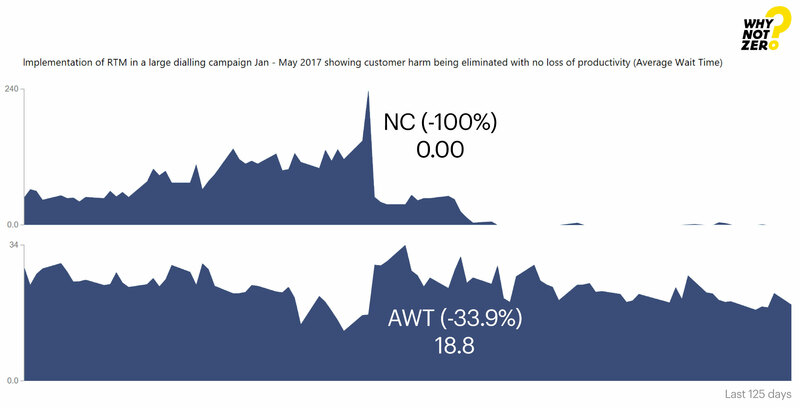 After implementing and then refining SNoDrop™ in the context of Responsible Telemarketing, the number of abandoned calls drops to zero. At the same time the AWT actually falls from an average of 28 seconds to an average of 18 seconds. The implications of this development are far reaching. First and foremost it provides a clear answer to the question whether the new Ofcom statement of policy is effectively a ban on the use of predictive diallers. That answer is a resounding “no” as the allegedly immutable link between predictive dialling and abandoned calls has been demonstrably broken. Secondly, it answers another important question. What might be the safe upper limit for a dialler’s ACR (Abandoned Call Rate) that would guarantee immunity from Ofcom’s unwanted attention? The answer to that question is now clearly zero. Ofcom have been coy in providing such a figure, or ‘safe harbour’ as they call it. Now we have it. It is 0.00%. In other words, it is absolute zero with a margin of error of one abandoned call for every 10,000 live calls made. Thirdly, it sets a benchmark against which all predictive dialler vendors can measure their technologies. If absolutely safe predictive dialling, with zero abandoned calls is possible, why would any call centre settle for anything else? It stands to reason that dialler operators will ask more of their suppliers in the not so distant future. Finally, it vindicates Ofcom’s ambitions to eradicate abandoned calls altogether and their insistence in the pursuit of complete protection for the public against this nuisance. It sets the UK regulator as a shining example to other bodies around the world. The technical breakthrough that the SNoDrop™ technology delivers, not only makes the complete eradication of abandoned calls a realistic goal but guarantees the survival of efficient, cost saving predictive diallers well into the 21st century.